African Farmer is available in two versions, a single player game and a multiplayer game. 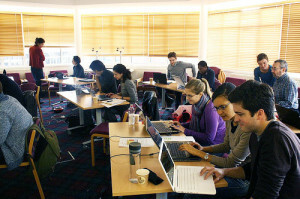 The multiplayer game is ideal for teaching or training at universities, schools or organisations working on agriculture in developing countries. In order to set up the game, you will need to download the game files (packaged as a ZIP file below) plus additional server and MySQL software (as explained in the Software Installation Guide). African Farmer Multiplayer Game (ZIP file, 8.5 MB) A package of files to be downloaded and installed to set up the game. Software Installation Guide (PDF, 360 KB) Links to additional software required, with instructions on how to install them and the game. An interactive overview of the game. Click on the Contents menu (slide 4) to browse the slideshow. This short video shows the steps involved in setting up and playing the Multiplayer game – filmed live at a workshop at the Institute of Development Studies in March 2014. Decide what to grow in the fields. Choose your family’s diet and look after their health. Buy food, seeds and other inputs from the market. Watch out for bad weather, disease, price rises and other chance events. Negotiate and trade goods, labour or money with other households. As the seasons change, you can track the results of your decisions, and adapt your strategy.